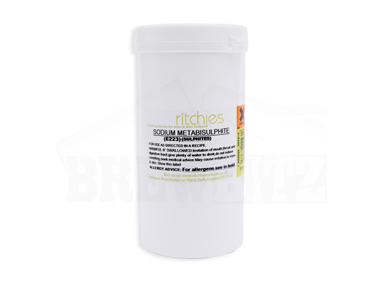 Buy Ritchies Sodium Metabisulphite 100g online from our UK Homebrew Shop. We sell Sodium Metabisulphite Powder - 100g and other genuine Ritchies products in the UK. Use Sodium Metabisulphite for sterilization of all home brew and household implements. For making beer and wine at home. Use Sodium Metabisulphite for sterilization of all home brew and household implements. For making beer and wine at home. Where to buy Ritchies Sodium Metabisulphite 100g safely online? Shop at the Stirling Homebrew Shop if you are wondering where you can buy Sodium Metabisulphite Powder - 100g safely online in the United Kingdom. Sodium Metabisulphite 100g - Sodium Metabisulphite Powder - 100g in Homebrew Chemicals and Homebrew.